Storks – Storks now deliver packages for an internet retail giant. The top delivery stork lands in hot water when the Baby Factory somehow produces an adorable but unauthorized girl. The race is on to deliver this bundle of trouble before the boss finds out. Miss Peregrine’s Home for Peculiar Children – When Jake discovers clues to a mystery that spans alternate realities and times, he uncovers a secret refuge. Jake realizes that safety is an illusion, and danger lurks in the form of powerful, hidden enemies. American Pastoral – A once legendary high school athlete, and now a successful businessman, is married to a former beauty queen. When his beloved teenage daughter disappears, he dedicates himself to bringing her home and reuniting his family. Christine (2016) – An aspiring newswoman feels she is destined for bigger things. Plagued by self-doubt, her diminishing hope rises when an on-air co-worker initiates a friendship. Disillusioned as her world continues to close in on her, she takes a dark, tragic turn. The Autopsy Of Jane Doe – Ottawa Premiere! Father and son coroners receive a young mysterious homicide victim. As they attempt to identify the beautiful young “Jane Doe”, they discover increasingly bizarre clues that hold the key to her terrifying secrets. Moonlight – Held Over for a 2nd Week! A timeless story of human connection and self-discovery that chronicles three chapters in the life of a young man from child to adult as he struggles to find his place in the world while growing up in a rough neighborhood. 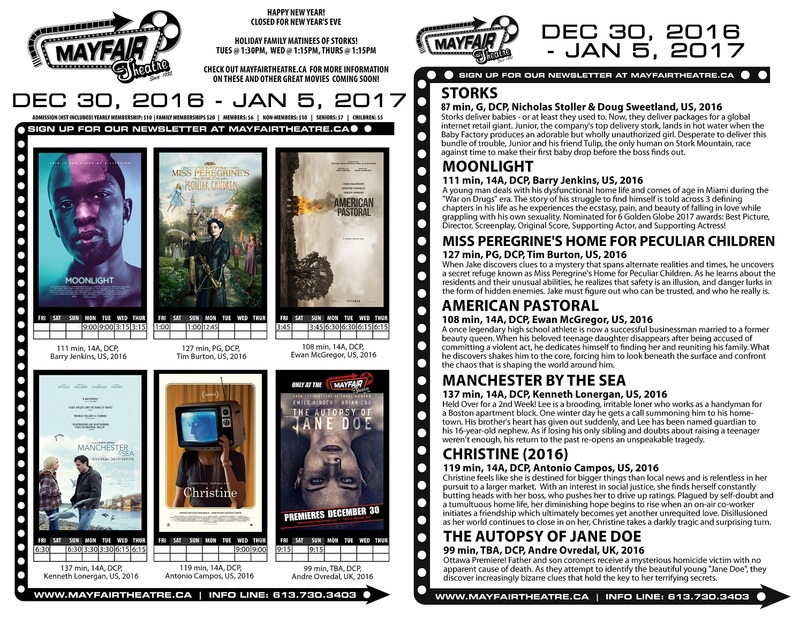 Manchester By The Sea – Held Over for a 2nd Week! A loner returns to his hometown. His brother has died, and he is named guardian to his nephew. If losing his sibling and doubts of raising a teen weren’t enough, his return home also re-opens a tragedy.